Calculating how much to tip doesn’t need to be complicated. Everyone has a different approach. Some of us double the tax (if there is one), which comes out to around a 20 percent tip and some us pull the smartphone out and get right to calculating. Thanks to smartphones with built-in calculator apps, we no longer have to tap the ol’ noggin to crunch some simple figures. Throughout the years, we’ve tried a number of tip apps, but none come close to Recompense. Don’t let Recompense’s simple and clean design fool you, the app packs plenty of versatility. Recompense is split into three parts. Opening the app prompts you to enter your bill total into the “balance” bar. From there, you’ll see the balance entered, a gratuity calculation and a total sum. You can tap the gratuity bar to adjust the percentage (I usually have it set to 15 percent by default) to 18, 20, 25, 30 or a custom number. The total sum is how much you owe, well, in all. 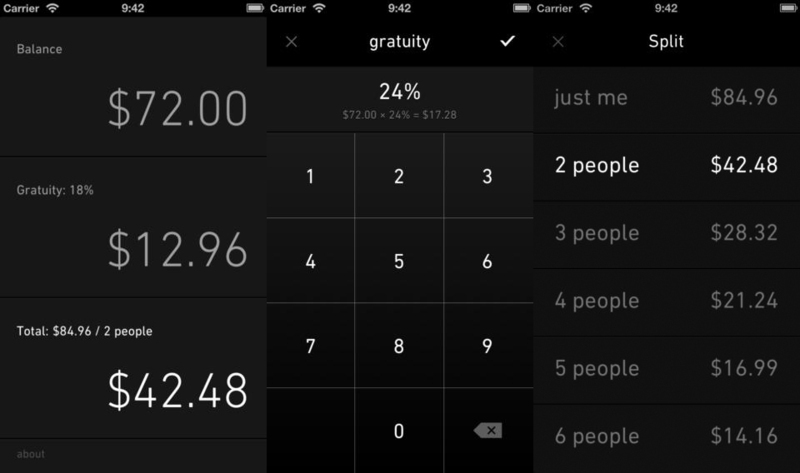 However, if you tap on the total bar, you can choose to split the total between any number of people. Also great is the ability to change between over 200 currencies (just tap the dollar sign on the balance bar). For instance, if I enter $326.70, Recompense will calculate a 15 percent tip is 49.01, which makes my total $375.71. And if I decide I wanted to split that bill with two good friends, the app will automatically calculate that we each owe $125.24; that’s with the 15 percent tip included for each of us. Recompense is such an indispensable app that it now sits on the first page of my iPhone 5, within a quick tap, because it’s so handy. Best of all: Recompense is free and has no ads. An actual good-looking app that’s useful and free, without ads. That’s a rarity. The only downside is Recompense is iOS-only.